Nature’s Sunshine actually has two thyroid supplements: one is called Thyroid Support and the other is Thyroid Activator. 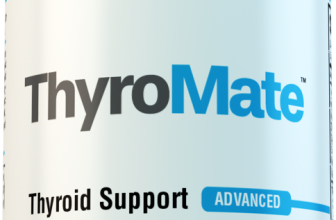 This reviews focuses solely on the first one, Thyroid Support, and not Thyroid Activator. We decided to do this because it seems that Thyroid Support is their flagship supplement. Thyroid Activator contains only herbs, specifically Irish moss plant, black walnut hulls, parsley leaves, fo-ti root and sarsaparilla root. None of these ingredients seems to be backed by any studies that show these help improve thyroid health on their website. Because of this, our team decided to only review Nature’s Sunshine Thyroid Support. WHAT IS Nature’s Sunshine Thyroid Support? 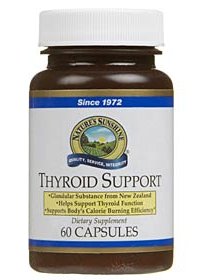 Nature’s Sunshine Thyroid Support is certainly an improvement over Thyroid Activator, but that’s not saying much. The first aspect we look at when reviewing thyroid supplements, is the formula of the product. Nature’s Sunshine Thyroid Support supports only one vitamin, four minerals and then a handful of herbs. The three minerals are: Zinc, Copper, and Manganese. The amount of each found in the product is a good ratio, but a thyroid support supplement should contain more than just four minerals. Furthermore, what concerns us, is that Nature’s Sunshine Thyroid Support contains no Iodine. If you didn’t know, Iodine is perhaps the most important mineral needed to synthesize thyroid hormones. Without Iodine, your thyroid cannot function properly. We were surprised to see absolutely no iodine in this product. It might have been a lack of knowledge on Nature’s Sunshine’s part or simply a bad decision, but whatever it was, I believe it was a bad choice to not include iodine and it certainly shows in online reviews. The herbs in this thyroid supplement like the nettle leaves will certainly make you feel better, but will not provide any benefit to your thyroid. Nature’s Sunshine did not link any studies nor were we able to find anything that would suggest these herbs are directly beneficial to your thyroid. Research may suggest that our can eventually build a tolerance to these herbs, and thus the effects will slowly diminish and after a while, you will not feel anything from the herbs. However, you certainly will not build a tolerance to the vitamins and minerals in Nature’s Sunshine Thyroid Support: Vitamin B6, Zinc, Copper, and Manganese. These vitamins are certainly some of the essentials but not all of them. A lot of thyroid issues, especially in patients with hypothyroidism, are not targeted through only these vitamins. You would need to buy another supplement to fully cover all the bases in respect to your thyroid. It was hard to find a lot of reviews that other people posted about this product, but we did find ones which were not very favorable. While this product is not very expensive, most people do not seem to notice a difference in this herbal supplement. Perhaps if Nature’s Sunshine included Iodine and other essential vitamins and minerals, their thyroid support product would be better. Unfortunately, they did not. It depends on each person as everyone seems to react differently. Some people might notice great effects with one brand and another won’t feel any difference. You can visit our top list here: https://thyroidadvisor.com/top-supplements/ to see what works for most people. Kelp is an edible brown seaweed that is ful of vitamins and minerals especially IODINE. Iodine can actually make some thyroid conditions worse. You should study that before you review thyroid products because you don’t sound educated enough on thyroid conditions to be making such claims. Also, some people may be allergic to iodine, so this product is excellent for them. A properly functioning thyroid also depends on the health of the hypothalamus and the pituitary gland, which respond extremely well to copper, zinc, and manganese. Not all thyroid issues have iodine as the root cause. I have used this product with many clients. It’s true that it doesn’t help everyone, but it is extremely helpful for the right individual. You’re definitely right that Iodine can worsen some thyroid conditions, usually those who have hashimoto’s thyroiditis or some form of allergy to certain foods that contain Iodine. However, the amount of people affected by this is a rather small subset. Sufficient Iodine consumption far outweighs the the potential drawbacks. Iodine supplementation is not a guaranteed solution, but for the vast majority of people with thyroid disorders, it will likely have great benefits for them. If you believe Iodine affects you in a negative way, you should definitely avoid it and seek supplements like this one that does not have Iodine. The vast majority of people, however, need Iodine and should look for thyroid support supplements that contain adequate amounts. Wha about iodine in salt? Isn’t that enough? Sorry I meant what about iodine in salt? Great information! However, Thyroid Support contains Kelp. Kelp is a group of large sea algae that is commonly referred to as seaweed. Kelp is considered the world’s most potent source of naturally occurring iodine. Because kelp contains an extremely high level of iodine (up to 2,984 micrograms in some varieties), it’s one of the best ways to maintain a healthy level of iodine. Powdered kelp has been used to treat hypothyroidism in patients with severe motor intellectual disabilities, who are at a very high risk of iodine deficiency. Does this help with weight loss as well? Thyroid problems are often associated with increased weight gain. Naturally, helping your thyroid can lead to the opposite effect. It is possible.